Heartland Funds published this white paper on microcaps earlier this year with some good historical data points on the microcap space. The Heartland Value Fund (HRTVX) is a value based micro-smallcap fund. The fund’s average market cap in the portfolio is $472 million. Over time, micro-caps have outperformed equities in all other capitalization ranges. In our view, this suggests that any investor whose portfolio allows for micro-cap exposure would be wise to seek it. The rather dramatic chart below shows the long-term outperformance of micro-caps versus other small-cap, mid-cap, and large-cap stocks. 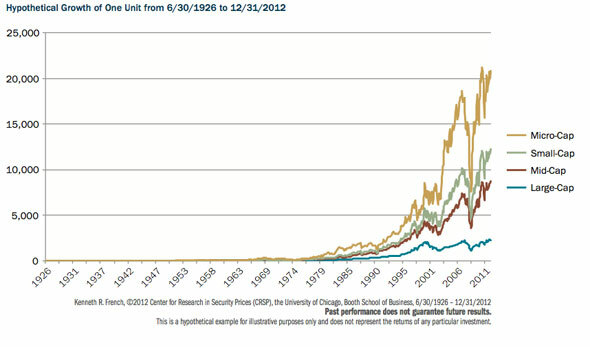 The data reflects the total return of one hypothetical unit if it were invested in each capitalization range, from 1926 through December 31, 2012. Not surprisingly, micro-caps exhibited greater volatility than other cap ranges. Many small-cap managers tend to gravitate toward the larger end of the market-cap spectrum, where information and liquidity are more readily available. In the micro-cap range, information is scarcer and liquidity less abundant. We believe most small-cap equity managers stay away from micro-caps for these reasons, which helps explain why they behave differently than larger small-caps.